We have also added all of these dates into an ical format file for anyone that wants to import them to their calendar. This works on iphone too! (please note this calendar may not be updated if trial dates change so it is always best to check the website on a regular basis). See you all at the presentation evening on January 16th for pie and peas! 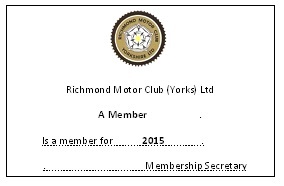 Richmond Motor Club Membership is now due. Please could you complete and send in your membership forms to our membership secretary Mrs Suffell (01325 378511) as soon as possible. For ACU membership please click on our Membership Information useful page for both RMC and ACU forms. Please could the winners of last years trophies double check to ensure you have returned them, we are still missing a few and need to get them engraved shortly as the awards presentation night will soon be upon us! Scott Rider Numbers and Final Instructions have been emailed out to all riders tonight. Please keep a look out in your inbox! With only 31/2 weeks to go we hope all the training is going to plan. Keep an eye on the website over the coming weeks for updates on the exciting centenary celebrations and special displays on the start field. The Centenary Programme will be out early October – watch this space!